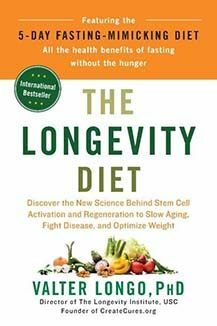 Read the research that ProLon founder Dr. Valter Longo has collected and distilled into a powerful guide to healthier living shared in his bestselling book The Longevity Diet: Discover the New Science Behind Stem Cell Activation and Regeneration to Slow Aging, Fight Disease, and Optimize Weight. While Anti-Aging Medicine touts diet as a cornerstone of health and longevity, the most current clinical research suggests that results are not solely dependent on what you are eating—but also when. This workshop reviews the benefits of intermittent fasting, and the nutritional breakthrough “Fasting Mimicking Diet” (FMD). Designed to provide the body with natural, nourishing ingredients, while not activating any of the pro-aging processes, this workshop examines the applications of intermittent fasting in metabolic syndrome, diabetes, cancer, autoimmunity, peptide therapy, weight management, and cellular rejuvenation programs.